A female employee stands beneath electronic screens displaying financial data at the Tehran Stock Exchange in Iran. One of the world’s hardest-to-enter stock markets just became more accessible to international investors. With a market cap of about $90 billion, Iran’s stock market is fifth-largest in the Middle East. The lifting of sanctions allows the country to compete for investor attention with Saudi Arabia, which opened the region’s biggest stock market to direct foreign ownership seven months ago. Even so, dozens of Europeans and Americans living in Europe have been on organizedinvestor tours to Iran over the past year, assessing the landscape and visiting some of the large, listed manufacturers. Many obtained the necessary trading codes and licenses to prepare for the removal of sanctions. “Initially we’ll have the braver sort of family offices, fund managers who will come in in the first six to eight months," said Soltanzadeh. These will be “setups that have done this in a lot more dangerous places in the world and they understand risk," he said. 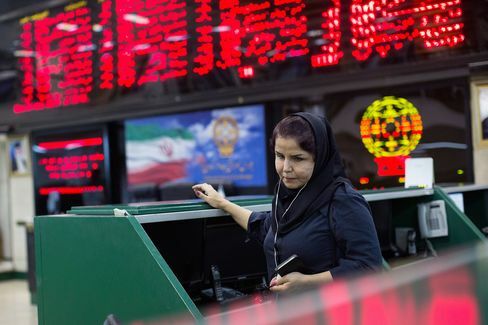 There are two ways to access Iranian equities: invest directly, or go through local funds, said Parham Gohari, co-founder of Frontier Partners, a professional-services firm advising multinationals on entering Iran. “There are two or three bodies involved if you want to get through the direct route," Gohari said from Dubai. When using a local fund, “you would have to do your homework and understand the performance of some of these companies over the last few years," he said. Can foreigners buy shares of any company? No. Sanctions remain in place on about 200 businesses and individuals, some of them connected to listed companies. They also apply to firms owned by certain institutions, such as the Iranian Revolutionary Guards. Sturgeon Capital, a London-based hedge fund, said it identified about 50 companies, or some 10 percent of those traded on the Tehran Stock Exchange, that were sanctions-compliant and not exposed to any entities previously sanctioned or that remain sanctioned after implementation of the nuclear deal. Are we going to see a big rush? Not Likely. The remaining sanctions are a nightmare for compliance departments of large institutions, even if they’re not U.S.-based.